There are a lot of options available now when it comes to budget 4K TVs, especially after all the hype following Xiaomi's Mi TV 4 launch. 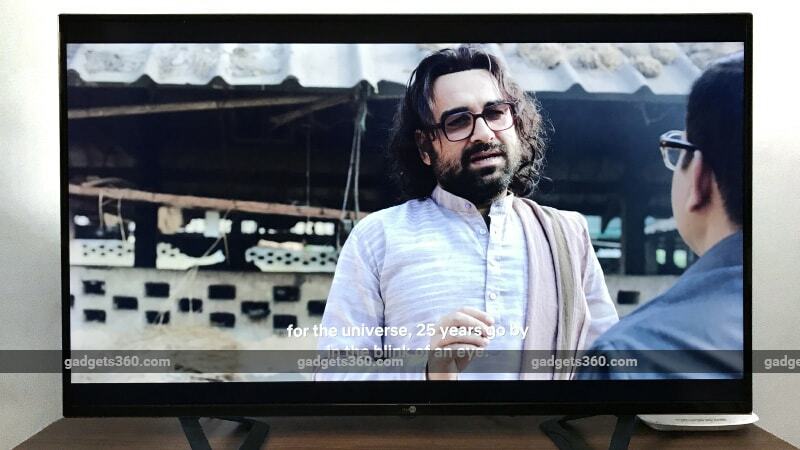 Amidst the crowd, Indian consumer electronics company Daiwa recently launched its new 4K Smart TV, which offers a number of interesting features. It's a true 4K UHD panel, capable of performing at 50 to 60Hz — unlike many other players that can only do 4K at 20-30Hz — and was recognised as such by all the external media players that we used during our review period. Despite the lack of HDR support, this TV does have the advantage of being priced at Rs. 36,999, which is really aggressive for a 55-inch 4K panel. It all comes down to whether its performance is good enough to make it easy for us to recommend. Well, that's exactly what we're going to talk about. This TV looks simple and straightforward. It has a thin black bezel that's around half an inch thick on all sides, except the bottom which is slightly thicker and accommodates the Daiwa logo and a status indicator. The body isn't too thick, at 81mm (without stand), and it can be mounted pretty close to a wall using the bundled bracket. The stand can be fitted facing outwards towards the edges, or inwards, giving you the option to make space for set-top boxes or other devices. It's not exactly premium to look at, but it isn't an eyesore either. It's more about function over form, and at its price, that's what matters. Connectivity options include three HDMI 2.2 ports, of which one supports ARC (Audio Return Channel). Then there are two USB ports, one USB 2.0 and the other USB 3.0, though one of them will be occupied permanently if you intend to use the keyboard function on the remote via the bundled dongle. 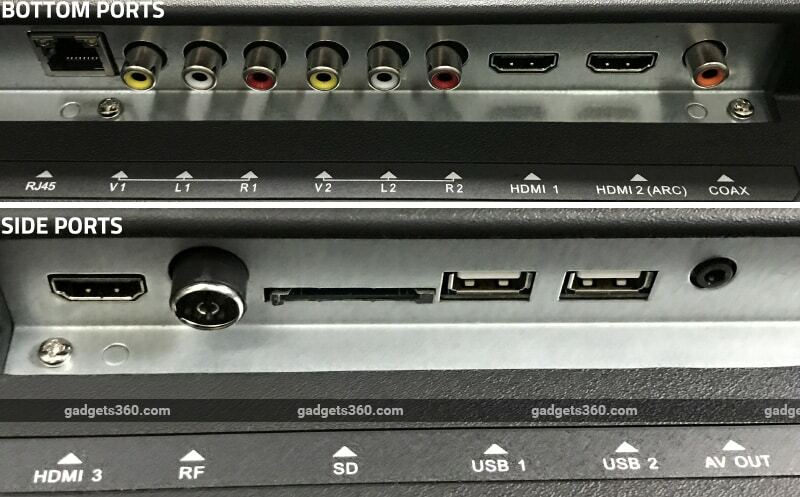 For audio output the TV has a 3.5mm line-out port that's confusingly marked as AV out, and a coaxial out for digital audio and surround sound. Other connectivity options include two sets of composite inputs, an SD card slot, an RF connector for a standard TV antenna, and an Ethernet port. The TV also supports Wi-Fi 802.11b/g/n connectivity, and Daiwa claims that you can even use the TV as a Wi-Fi hotspot. There's no Bluetooth, which is why a bundled USB dongle for the keyboard remote is needed. The D55UVC6N is powered by an unspecified CPU with two ARM Cortex-A53 cores. There's 1GB of RAM and 8GB of internal storage, out of which you get a little more than 4GB to use for apps. You can use an SD card or USB device as additional storage for videos, pictures, and music, but not for installing apps. The TV supports Miracast, so you can stream content directly from your PC or any compatible device. 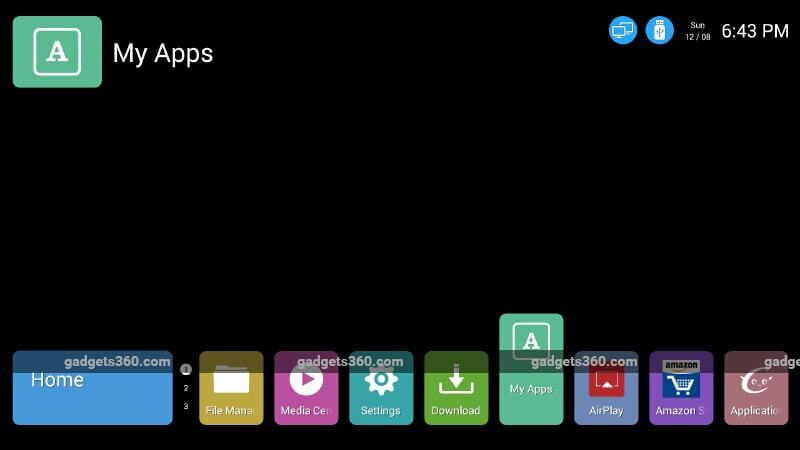 There's even a preinstalled AirPlay app, but we could only get it to receive audio from our Apple devices, not mirror the screen of an iPhone or stream videos or photos to the TV. Daiwa has used an LED-edgelit LCD panel with a 6.5ms response time and peak brightness of 400 nits. The company claims that this panel has a viewing angle of 178 degrees, but we found that colours and contrast tended to degrade slightly beyond roughly 140 degrees. There were no noticeable light leaks on the panel, which is always a good sign for a budget TV. The Daiwa D55UVC6N runs a highly customised version of Android 4.4.4 (KitKat) and uses mobile versions of apps instead of the Android TV ones. This means that you have to use motion controls, and apps can't easily be navigated using the arrow keys on the remote. 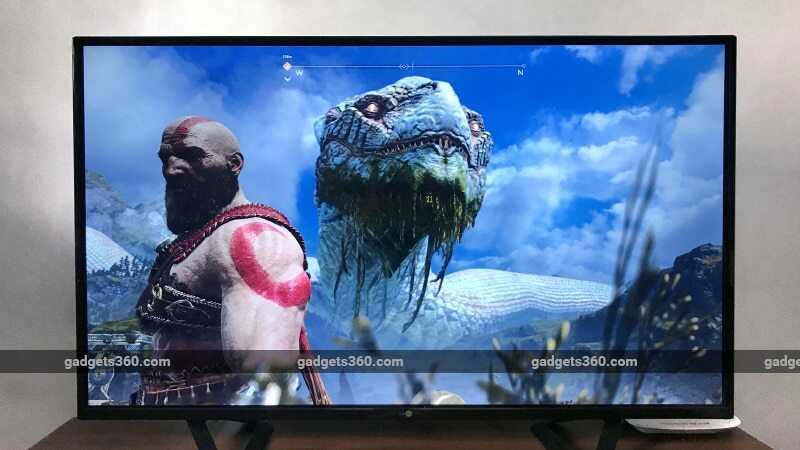 A bigger problem however, is that even though this is a 4K display, none of the popular streaming media apps such as Netflix, Hotstar, and YouTube support 4K on it. All them could only play video at up to full-HD, which will be understandably disappointing for buyers who think they're getting an all-in-one smart 4K TV solution, and you will need to rely on external media players for a true 4K experience. We found that the TV's default settings made the picture look over-bright, over-sharpened, and a bit burnt out due to the high contrast. Calibrating the settings to our test environment's lighting brought out pretty good overall picture quality, which we'll talk more about in the performance section of the review. 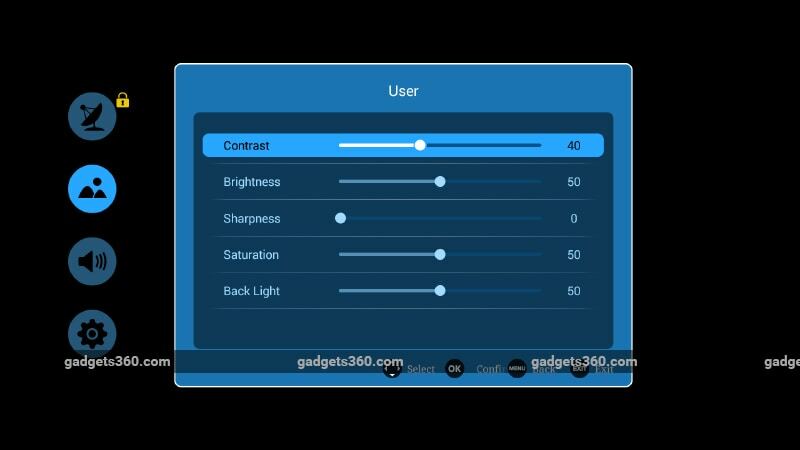 The settings we used can be seen in the screenshot below. The D55UVC6N has a pair of 10W bottom-firing speakers that can get pretty loud, but the sound is dull, though you can use the audio-out ports to connect an external speaker. 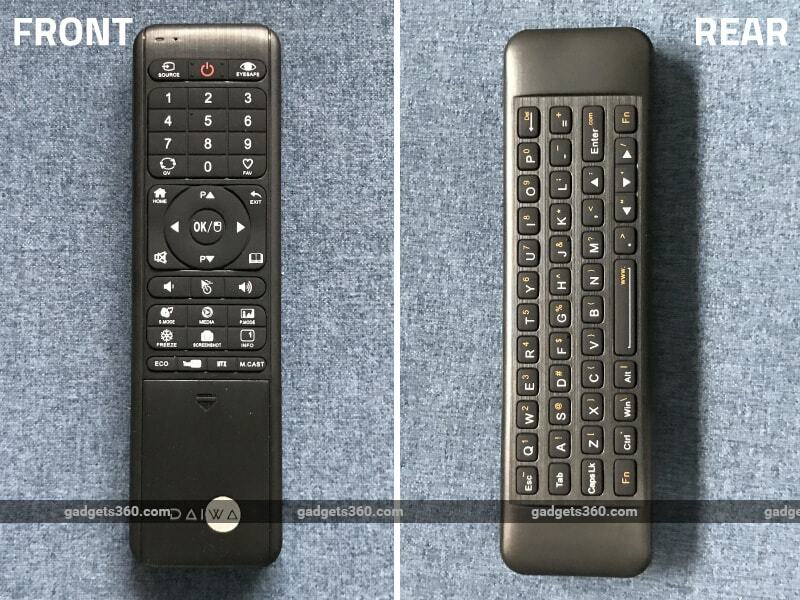 The remote control is dual-sided with the traditional TV control buttons on one side, and a QWERTY keypad on the other. The front also has a nifty mouse pointer option for the air mouse that makes navigation a lot easier — especially with the poorly optimised Android apps — than using traditional controls. It didn’t take us much time to get used to, and we found it pretty responsive to our gestures. Moreover, you can't dismiss pop-ups in many apps unless you use the mouse cursor to click "Ok", "Agree" or whatever option they're presenting. This could be a usability issue for someone who's not very tech savvy, as a basic level of app operation is required. That said, if you know your way around common smartphone apps, this should not be an issue. The remote has all the options you'd need to use the TVs smart functions, and there are shortcuts for YouTube, Netflix, the TV's default media player, and also the Miracast option, to make things easier. The rubber buttons are easy to press, though there is often a noticeable delay when navigating through the Smart TV interface. Finally, it's worth mentioning that you might struggle to find the picture settings button on the remote, which uses the icon of a book for some reason. We've already stated that the Daiwa D55UVC6N's native apps can't play 4K content, which makes it questionable to even use it as a smart TV. Moreover, we found that the default media player, which is an extension of the TV's file manager app, had trouble playing 4K files too. Though video playback was smooth, it couldn't handle AC3 audio, and stretched all videos to fit the 16:9 aspect ratio. We tried using VLC Player to fix this, but video playback was jarringly bad, with videos only playing in short bursts. To test the true capabilities of the panel (and not the software it runs), we connected it to external devices including a PlayStation 4 Pro and an Apple TV 4K. The results were far better. With 4K media finally playable through these external devices, we tested the TV with a variety of TV shows, movies and games. The overall image quality was quite pleasing, with good colour reproduction, including rich reds, deep blues, and distinct gradation in greens. The contrast can get a bit aggressive in parts of a frame, leading to dark and bright shades appearing a bit too dark or burnt-out, but that was noticeable only on rare occasions. The outdoor yard scenes in Netflix's Orange Is The New Black are an example of when we noticed this. It wasn't noticeable in other shows, including Stranger Things, Marvel's The Punisher, and Lost In Space, which all have a more cinematic colour tone. The panel got pretty bright using the maximum backlight level, and we found ourselves reducing it as can be seen in the settings we showed above. That worked well when watching films with darker settings, such as Netflix's Bright. We found that the quality of full-HD video upscaling was a lot better when we played it using external devices, which of course factors in the upscaling capabilities of the source devices as well. Gaming was where the TV performed best. Despite the 6ms response time, we didn't encounter issues when trying twitch-based games such as Injustice 2, or online multiplayer games such as Paladins (tested using a Nintendo Switch). The upscaling of Nintendo Switch games was handled decently, but if you need better picture clarity for full-HD gaming and media, it would be better to opt for a native full-HD panel instead. If it's 4K gaming you want and you can do without HDR, then this TV would be a pretty good option at a budget. As we mentioned earlier, the audio quality is nothing to write home about. The built-in speakers would just about suffice if you're using this TV for news and shows with a lot of dialog. If you're watching an action movie or sports, or even playing games, you really should consider using an external speaker system. The Daiwa D55UVC6N has a good panel, better than some of the other 4K budget TVs we've tested so far. Unfortunately, it's gimped by sub-par smart TV software and user experience. If you're excited about upgrading to a 4K TV, which you should be, the native apps will only disappoint you. However, if you're looking for a low-cost screen for a PS4 Pro, or any other external device that supports 4K output, then this device has a lot to offer. For around Rs. 9,000 more, there's the Xiaomi Mi TV 4, which offers you 4K with HDR support, and the latter is a bigger reason to upgrade. It's definitely worth a consideration if you can stretch your budget. product Daiwa's budget 4K TV is a great screen for external devices. Its smart TV functionality is another story though.